Despite the last week being cold and dreary, we are ahead of season in the Rhone Valley this year. The plump little baby fennel bulbs are no longer coming to Lyon's markets, the window only having lasted a few days here. No matter, since fennel, no matter what the size, in addition to being braised or steamed and served with any number of sauces, is wonderful raw in salads. 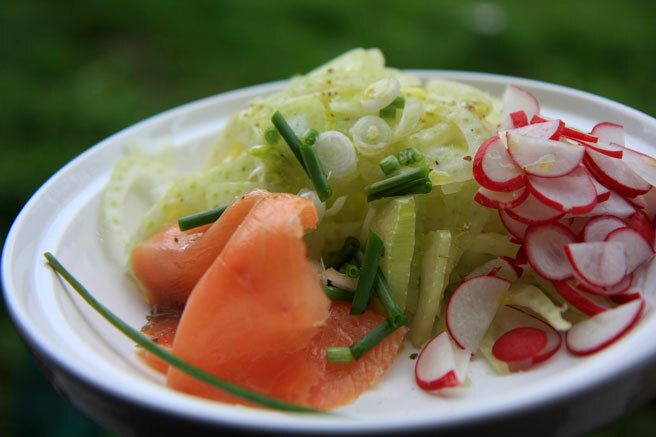 I love the crunch of it raw and the way the hint of anise flavor harmonizes with smoked fish of any kind, be it smoked trout, salmon, or herring. This salad was inspired by a poet friend of mine, created one early spring morning while she sat upstairs in the mountain house shuffling cards. I put it together thinking of her courage to pass wholeheartedly through the door into being the artist she is. I respect that. Instead of trying to find something otherwise busy or acceptably useful to distract herself from the constant pull that would eventually win anyway, she ducked her head, went through that door, and embraced her vocation with humility and grace. Whenever I make this salad now, I think of her. 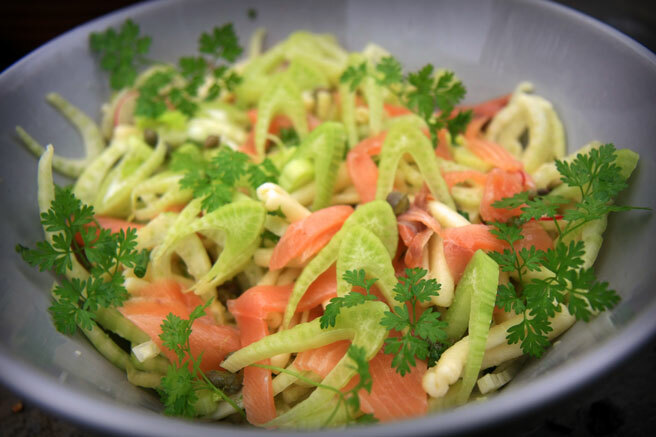 The ingredients listed here are suggestions for the salad - apart from the fennel bulbs, smoked fish, chervil and capers, you can mix or match according to what you've got at any given time. If you do use kippers (smoked herring), be sure to soak them in milk first before rinsing and slicing them, to remove as much salt as you can. you can also add rice or cold pasta. Put the ingredients for the sauce in a small bowl and, whisk them until milky, or give them a blast with the stick blender. Layer the rest of the ingredients in the bowl, composing it as you would like it to be presented, and toss the lot with a pair of salad tongs once the bowl is presented at the table. You can serve with with garlic toast or make croutons as well, or simply make composed individual salads on single plates, on a day that you're serving this as part of a sit down lunch with guests. This salad goes very well with a crisp Apremont from the Savoie. Goh, that salad looks so deliciously fresh and crunchy... I wish fennel was in season here in South Africa! It's interesting, I only like fennel raw, just like this! Am surprised you can find fiddle heads. I think in Paris, they're be quite a jolt! Thank you for coming by you two! David, we collect the fiddleheads out walking in the woods up in the mountains, early spring they are everywhere. This salad seems wonderful, and your poet friend even more wonderful. I would say they are equally wonderful. Yum. What a delicious sounding salad. I enjoy fresh fennel. Here, in Southern California, it can be found wild, too. You and your poet are fortunate in your friends :). This is gorgeous. I can't believe I never thought to pair fennel with lox before but I'm trying this as soon as possible. I'm also loving that blue serving bowl- guessing it's a great workhorse for every kind of serving.